Despite nearly three decades of revolutionary government rule, poverty and inequality remain the central issues of political debate in Iran. The unexpected electoral victory of Ahmadinejad, the populist candidate in the 2005 presidential election, has been widely attributed to rising poverty and inequity. Using household survey data, I examine the trends in poverty and inequality for the last three decades and show that this thesis is not grounded in facts. Survey data show that poverty has substantially declined in recent years, and is low by international standards and in comparison with pre-revolution years. This finding is consistent with pro-poor policies of the Islamic government, mainly in provision of basic infrastructure such as electricity, safe drinking water, and health. However, the same policies have not been as effective in reducing inequality, which, after an initial decline following the Revolution, has remained basically constant in the post-Revolution period. 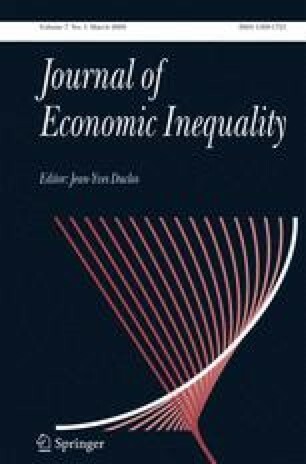 An earlier version of this paper was presented at the Third Annual World Bank Conference on Inequality, Washington, DC, June 5–6, 2006. I wish to thank for comments Francisco Ferreira, Hojat Ghandi, Farrukh Iqbal, Essie Maassoumi, Branko Milanovic, Javad Shirazi, Vijayendra Rao, and two anonymous referees. For able research assistance I am grateful to Ali Hashemi and Marenglen Marku, and for access to survey data to the Statistical Center of Iran. All errors are mine.